Albert stain is basically made up of two stains that is Toluidine blue’ O’ and Malachite green both of which are basic dyes with high affinity for acidic tissue components like cytoplasm. The pH of Albert stain is adjusted to 2.8 by using acetic acid which becomes basic for volutin granules as pH of volutin Granule is highly acidic. Albert’s iodine due to effect of iodine, the metachromatic property is not observed and granules appear blue in colour. Dissolve the dyes in alcohol and add to the distilled water and acetic acid. Allow the stain to stand for one day and then filter. Prepare a smear on clean grease free slide. Treat the smear with Albert’s stain and allow it to react for about 7 mins. Drain of the excess stain do not water wash the slide with water. Flood the smear with Albert’s iodine for 2 minutes. Wash the slide with water, air dry and observe under oil immersion lens. 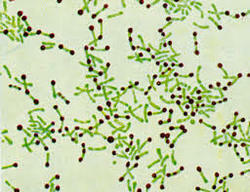 If Corynebacterium diphtheria is present in the sample it appears green coloured rod shaped bacteria arranged at angle to each other, resembling English letter ‘L’, ‘V’ or Chinese letter pattern along with bluish black metachromatic granules at the poles. This helps to distinguish Corynebacterium diphtheriae from most of the short nonpathogenic diphtheroides which lack granules.